The video can be enlarged to eliminate visual impact of the text and images surrounding the video. 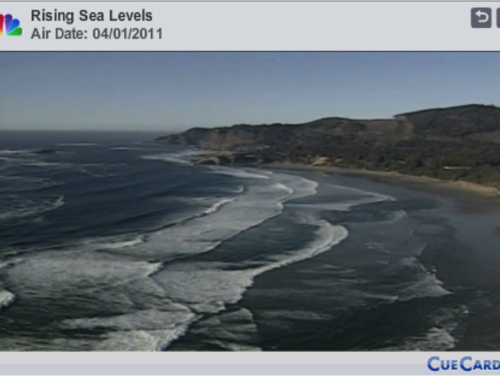 The video also shows the ways that sea level rise is determined. These include the use of sediment core data and satellite data to document rate of sea level rise in the past. The video also describes a laboratory model that examines how warming ocean currents reach Antarctica where they contribute to the melting of ice sheets. References to projected sea level rise in the coming decades is a highly dynamic field. Estimates change as research progresses and teachers need to be aware of this; seek up-to-date data as needed. Comments from expert scientist: Includes interviews with two leading scientists in the field and provides visuals of the sources of the data (sediment cores, satellite measurements, physical models, computer models). This video can be part of a lesson or activity that explores issues of ocean circulation, the melting of continental ice sheets, and the impacts of sea level rise. A transcript accompanies the video. While a "full screen" button is not provided, it is possible to enlarge the image. The resolution is sufficient to make the image essentially full screen. Alternatively, a standalone version of the video can be found at https://science360.gov/obj/video/ff880d9c-7acd-4a08-b60e-7c784e5859a6/ri.... This version does have a full screen option.